Our VH400 series soil moisture sensor probes allow precise, low cost monitoring of soil water content. Because our probes measure water content of the soil using transmission line techniques, they are insensitive to water salinity, and will not corrode over time, as do conductivity based probes. Our probes are water proof, small, rugged, low power, and can be burried at any depth. Compared to other low cost sensor such as gypsum block sensors, our probes offer a rapid response time. They can be inserted and take an accurate reading in under a second. Probes come in standard cable lengths of 2 meters, 5 meters and 10 meters. Extreme low cost with volume pricing. Consumes less than 13mA for very low power operation. Measures volumetric water content (VWC) or gravimetric water content (GWC). Output Voltage is proportional to moisture level. Red POWER: 3.5V to 20 VDC. 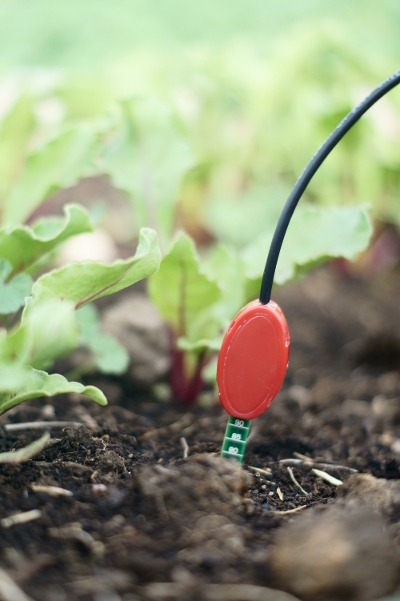 The Techno Gardener shows you how to wire up a Vegetronix soil moisture sensor to a digital multimeter. Hent manual ENG klik her.